Few things make your blood boil more than when someone nicks your bike. 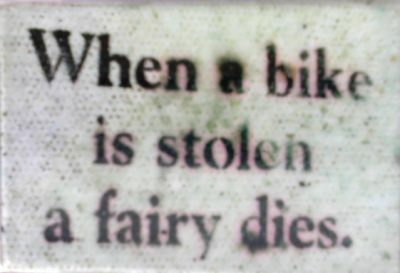 What’s more it can take away some of the joy and happiness that’s a part of cycling, with 1 in 4 reducing the amount they cycle following their bike being stolen, and a whopping 1 in 6 (17%) don’t replace their bike (Bike theft – impact on cycling). The first thing to do is report it to the police by calling 101 (or 999 if you see it happening) or fill in the Report a Crime or Incident form and get a crime reference number. When you’ve got a crime report number you should head on over to both BikeRegister (as recommended by Police) and Stolen Bikes UK websites and fill in a report. Both sites let you find out about the shocking number of other bikes stolen in the area. If your bike is stolen, we recommend that you check online websites including Gumtree, eBay, Shpock and Facebook Marketplace to see if it has been listed for sale. You can also set up alerts on many of these websites to inform you if a bike with the same make and model becomes listed at a future date. If you have found your bike for sale either online or in a bike shop, we do not recommend that you try and deal with the case yourself, meet up with the seller, or try and buy your bike back as this can be dangerous. We recommend that you contact the Police on 101 who can advise you of the best course of action.